This message just came in on Monday, and I love this boat. Can you help name it? 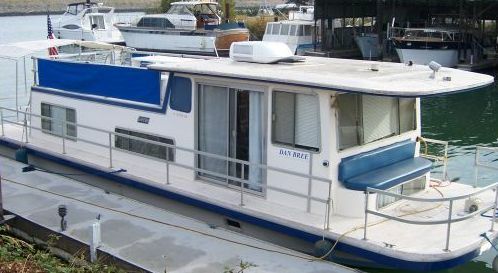 4 people in the family and bought a 1979 Gibson houseboat. Last name is Winn. We want to play off of our last name. Thought of integrating our last name "Winn" in with some other letters, words or phrases (maybe with "in" or "win") to make the boat name. We thought of "The Winncredibles" and "Winnsanity" but want your ideas. How about jumping on the Charlie Sheen hype with a name like "WINNING", or something like "Big Winn" (or the more modern version of the phrase, "Epic Winn"). BTW, we grabbed this photo from a similar 79 Gibson in California that is for sale on YachtWorld. looks like a Winnebago motorhome on the water to me, I'd name it a Winnaboatgo. I'd call it a Winn-Winn Situation.